CD1d-restricted invariant NKT (iNKT) cells play important regulatory roles in various immune responses, including antitumor immune responses. Previous studies have demonstrated quantitative and qualitative defects in iNKT cells of cancer patients, and these defects are clinically relevant as they are associated with poor prognosis. In this study we demonstrate that defects in the iNKT cell population can, at least in part, be attributed to defective interactions between iNKT cells and CD1d-expressing circulating myeloid dendritic cells (mDC), as mDC of patients with advanced melanoma and renal cell cancer reduced the activation and Th1 cytokine production of healthy donor-derived iNKT cells. Interestingly, this reduced activation of iNKT cells was restricted to patients with low circulating iNKT cell numbers and could be reversed by IL-12 and in part by the neutralization of TGF-β, but it was further reduced by the neutralization of IL-10 in vitro. Additional experiments revealed discordant roles for TGF-β and IL-10 on human iNKT cells, because TGF-β suppressed iNKT cell activation and proliferation and IFN-γ production while IL-10 was identified as a cytokine involved in stimulating the activation and expansion of iNKT cells that could subsequently suppress NK cell and T cell responses. The CD1d-restricted invariant NKT (iNKT)3 cells display a semi-invariant TCR (Vα24/Jα18 in human and Vα14/Jα18 in mouse) and are characterized by their capacity to rapidly produce large amounts of cytokines upon stimulation. iNKT cells have been shown to promote antitumor immune responses by rapidly producing copious amounts of IFN-γ, resulting in the activation of NK cells, dendritic cells (DC), and conventional CD4+ and CD8+ T cells as well as in the inhibition of tumor angiogenesis (reviewed in Refs. 1, 2, 3, 4, 5, 6). Importantly, the circulating pool of iNKT cells shows quantitative and qualitative defects in cancer patients independent of tumor type and tumor load (7, 8, 9, 10), and these defects are clinically relevant as increased numbers of intratumoral or circulating iNKT cells are associated with improved prognosis in colon cancer, head and neck squamous cell carcinoma, hematological malignancies, and neuroblastoma (11, 12, 13, 14). Several studies indicate that the residual pool of iNKT cells of cancer patients is Th2 biased, although this might not be the case in all types of cancer (8, 9, 10). The cause of the observed defects in iNKT cells in cancer is incompletely understood, but these defects do not appear to be intrinsic to iNKT cells as they can be overcome through repeated stimulation by monocyte-derived DC (moDC) or IL-12 exposure (7, 9, 10). Insight into the cause of the observed defects in iNKT cells is important because it might provide clues as to how to restore iNKT cell levels and function, thereby potentially improving antitumor immune responses. DC play critical roles in the initiation of immune responses that, depending on the microenvironment and DC subtype (e.g., myeloid vs lymphoid), can support either Th1- or Th2-type immune responses (15). A decrease in the proportion of circulating myeloid DC (mDC) has been observed in patients with head and neck squamous cell carcinoma (16), and in patients with locally advanced pancreatic cancer the population of circulating mDC1 was not only found to be reduced in size but also reduced in T cell allostimulatory activity and in the capacity to produce IL-12p70 (17). There is considerable evidence that iNKT-DC interactions help initiate and regulate immune responses (18, 19, 20). Induction of IFN-γ from iNKT and IL-12 from DC can act as a “positive feedback loop” and drive Th1 responses (1, 2, 18, 19, 20, 21, 22). We recently showed that the circulating human CD1d+ DC subset, mDC1, responds like iNKT to high-dose IL-2 treatment, whereas CD4+CD25+ regulatory type T cells behaved reciprocally (23). We hypothesized that the reported quantitative and/or qualitative differences in the circulating DC of cancer patients could contribute to the observed defects in iNKT cells and we therefore compared interactions between iNKT cells and CD1d-expressing circulating DC from healthy donors and patients with advanced cancer. In this study, we report that circulating mDC1 of patients with advanced melanoma and renal cell cancer (RCC) result in reduced activation and a biased cytokine profile in iNKT cells and can therefore be considered to be at least one factor involved in causing the quantitative and qualitative defects in iNKT cells in cancer patients. Of interest, although the reduced activation of iNKT cells could be reversed by IL-12 and, in part, by neutralization of TGF-β, we found that the neutralization of IL-10 actually resulted in a further decrease in iNKT cell activation, suggesting a stimulatory role for IL-10 in iNKT cell activation. Indeed, in additional experiments using healthy donor-derived iNKT cells we found that IL-10, in contrast to TGF-β, enhanced iNKT cell activation and expansion and resulted in a population of iNKT cells that subsequently altered the IFN-γ-producing capacity of NK cells and activated CD4+ T cells. Patients (mean age 53 years, range 30–68 years; 15 males and 10 females) in this study had been diagnosed with either advanced melanoma (n = 15) or RCC (n = 10). Several patients with metastatic melanoma were previously treated with dacarbazine or temozolomide; several patients with metastatic RCC previously received experimental treatment with a tyrosine kinase inhibitor. Peripheral blood of all patients was drawn before the institution of high-dose IL-2 therapy. Informed consent was obtained from all patients and the study was approved by the Committee for Clinical Investigation of Beth Israel Deaconess Medical Center, Boston, MA. PBMC were obtained by Ficoll-Paque (Amersham Biosciences) density gradient centrifugation of heparinized peripheral blood. PBMC were stained using combinations of the following reagents after an initial incubation with 10% human pooled serum to reduce nonspecific binding: FITC-labeled CD3, FITC-labeled CD25, PE-labeled CD1d, PE-labeled CD40, PE-labeled CD80, PE-labeled CD86, PE-Cy5-labeled CD19, and PE-Cy7-labeled CD14 (BD Pharmingen); PE-labeled Vα24 and FITC-labeled Vβ11 (Immunotech); FITC-labeled BDCA-1, BDCA-2, and BDCA-3 (Miltenyi Biotec); and PE-labeled anti-human IL-10Rα (R&D Systems). Flow cytometry was performed on a Cytomics FC500 (Beckman Coulter). iNKT cells were enriched from PBMC of healthy adult volunteers by positive selection using biotinylated anti-invariant TCR mAb (clone 6B11) in combination with anti-biotin microbeads (Miltenyi Biotec) and subsequently expanded using 100 U/ml recombinant human (rh)IL-2 (National Biological Response Modifiers Program, National Cancer Institute, Frederick, MD) and α-galactosylceramide (α-GalCer (KRN7000); provided by the Pharmaceutical Research Laboratory, Kirin Brewery)-loaded, LPS-matured moDC, which were irradiated before use. In some cases iNKT cell lines were further purified using high speed sorting (Modular Flow FACS; Cytomation). The purity of iNKT cell lines used for the experiments was >95%. In total, seven different healthy donor-derived iNKT cell lines (both CD4+ and CD4−) were used with similar results. Circulating mDC1 were isolated from cancer patients and healthy adult volunteers by high speed flow cytometric sorting of PBMC that were depleted of T cells using anti-CD3 microbeads (Miltenyi Biotec). Purified mDC1 (>90%) of both healthy volunteers and cancer patients were then cocultured with healthy donor-derived iNKT cells for 48 h in RPMI 1640 medium (Mediatech) containing l-glutamine, 2-ME, HEPES buffer, 0.02 mg/ml gentamicin (all from Invitrogen), 10% FBS (Gemini Bio-Products), MEM amino acids, and nonessential amino acid solution for MEM (Mediatech) in the presence of 100 ng/ml α-GalCer and 20 U/ml rhIL-2 and the presence or absence of the following reagents: 10 μg/ml anti-human CD40 mAb, 10 μg/ml anti-human B7-2 mAb, 10 μg/ml anti-human TGF-β1–3, 10 ng/ml rhIL-12p70 (all R&D Systems), 10 μg/ml anti-human CD1d mAb (clone 51.1), 10 μg/ml anti-human and viral IL-10 (BD Pharmingen), and the appropriate isotype controls (10 μg/ml). After 48 h supernatants were harvested for the detection of IFN-γ and IL-4 by standard capture ELISA with matched Ab pairs in relation to cytokine standards (Endogen) and iNKT cells were harvested for the detection of CD25 expression by flow cytometry. iNKT cell lines were cocultured with α-GalCer-loaded mature moDC (1 × 105 iNKT cells and 5 × 104 moDC) for 24 h in the presence or absence of 100 ng/ml rhIL-10, 10 ng/ml rhIL-12p70, and 10 ng/ml rhTGF-β1 as indicated (BioVision). Supernatants were harvested for the detection of IFN-γ and IL-4 by ELISA, and iNKT cells were harvested for the detection of CD25 expression by flow cytometry as well as for the detection of cytokine secretion. For the latter purpose, iNKT cells were washed and coated with Ab-Ab conjugates directed against CD45 and IFN-γ (catch reagent; Miltenyi Biotech) and subsequently cultured for an additional 3 h in plain medium. After washing, cells were incubated with PE-labeled anti-IFN-γ Ab (detection reagent; Miltenyi Biotech) and analyzed by flow cytometry. To evaluate the effects of IL-10, IL-12, and TGF-β1 on the expansion of iNKT cells, iNKT cell lines were cocultured with α-GalCer-loaded mature moDC in the presence or absence of 100 ng/ml rhIL-10, 10 ng/ml rhIL-12, or 10 ng/ml rhTGF-β1 for 5 days, and 50 U/ml rhIL-2 was added on day 2. After a 24 h coculture of iNKT cells and α-GalCer-loaded mature moDC in the presence or absence of 100 ng/ml rhIL-10, iNKT cells were harvested, washed 4 times by centrifugation in medium, and subsequently cultured in plain medium. After an additional 24 h these iNKT cell supernatants were harvested and used as the culture medium for either purified CD4+ T cells (isolated from PBMC using positive magnetic bead selection; Miltenyi Biotech) or purified NK cells (isolated from PBMC using negative magnetic depletion of CD14+, CD19+, and CD3+ cells; Miltenyi Biotech). In these iNKT cell supernatants, purified CD4+ T cells were activated by 1 μg/ml soluble anti-CD3 mAb for 3 days and then washed and coated with Ab-Ab conjugates directed against CD45 and IFN-γ (cytokine catch reagent) for a final 3 h culture in plates containing plate-bound anti-CD3 and anti-CD28 mAb (BD Pharmingen). Purified NK cells were cultured in iNKT cell supernatants without further stimulation for 24 h and then washed and coated with Ab-Ab conjugates directed against CD45 and IFN-γ (cytokine catch reagent) for a final 3-h culture in plain medium. Secretion of IFN-γ by CD4+ T cells and NK cells was analyzed by flow cytometry. Statistical analyses were performed using paired and unpaired Student t tests as indicated. p < 0.05 was considered significant. In peripheral blood, several subsets of DC can be identified based on the expression of BDCA-1 (mDC1), BDCA-2 (plasmacytoid DC (pDC)), and BDCA-3 (mDC2) (24). We compared the frequency and CD1d expression of each subset among PBMC of healthy volunteers (n = 7) and cancer patients (n = 17). As Fig. 1⇓A demonstrates, the frequency of mDC1 and pDC was comparable in patients with melanoma or RCC and healthy controls (p = 0.35 and p = 0.72, unpaired t test). Although the frequency of mDC2 was low in both healthy controls and cancer patients, it was significantly lower in cancer patients (p = 0.02). Importantly, CD1d was predominantly expressed by mDC1 (Fig. 1⇓B), confirming earlier reports (23, 25), and expression levels were found to be comparable in healthy controls and cancer patients (p = 0.65). As the CD1d Ag-presenting molecule is required for the presentation of glycolipid Ag to iNKT cells, mDC1 were selected for additional experiments. Frequency and CD1d expression of circulating DC subsets. Frequency (A) and CD1d expression (B) of circulating mDC1, pDC, and mDC2 in healthy controls (open bars, n = 7) and patients with advanced melanoma or renal cell cancer (closed bars, n = 17) are shown. Data represent mean and SD. The Ag-presenting functions of the circulating mDC1 of cancer patients and healthy controls were compared by analyzing their capacity to activate healthy donor-derived α-GalCer-reactive iNKT cell lines (purity > 95%). Circulating mDC1 of both healthy volunteers and cancer patients were purified (purity > 90%) by high-speed flow cytometric sorting and cocultured with healthy donor-derived iNKT cells in the presence of 100 ng/ml α-GalCer. The proportion of iNKT cells induced to express CD25 using healthy donor-derived mDC1 was standardized to 100%. Interestingly, we found that circulating mDC1 isolated from cancer patients with a low frequency of circulating iNKT cells (peripheral blood iNKT frequency of 0.003 ± 0.002% (mean ± SD); n = 6) resulted in reduced activation of healthy donor-derived iNKT cells, whereas circulating mDC1 isolated from cancer patients with a normal frequency of circulating iNKT cells (peripheral blood iNKT frequency of 0.05 ± 0.05%; n = 4) induced normal activation of healthy donor-derived iNKT cells. Compared with mDC1 of healthy volunteers, the relative proportion of iNKT cells expressing CD25 was found to be 64.5 ± 20.6% when mDC1 of iNKT-low cancer patients were used (Fig. 2⇓A; p = 0.008, paired t test), which corresponded with an absolute decrease of 10.5 ± 4.9% (p = 0.003), and 153.8 ± 26.6% when mDC1 of iNKT-normal cancer patients were used (p = 0.01, paired t test). Importantly, in all cases the activation of iNKT cells was restricted by CD1d as indicated by the significant reduction in iNKT cell activation in the presence of blocking anti-CD1d mAb (Fig. 2⇓A; healthy controls, p = 0.001; iNKT-low cancer patients, p = 0.003; and iNKT-normal cancer patient, n = 1). Consistent with these observations, the cytokine profiles of responding iNKT cells as determined by ELISA were comparable when using mDC1 of healthy controls or iNKT-normal cancer patients (Fig. 2⇓B; n = 3, p = 0.24, paired t test) but significantly biased toward Th2 cytokine production in iNKT-low cancer patients (Fig. 2⇓B; n = 5, p = 0.002). Again, cytokine production was inhibited in the presence of anti-CD1d mAb (not shown), indicating the specificity of the interaction between iNKT cells and mDC1. Activation and cytokine profile of iNKT cells activated by circulating mDC1. Relative CD25 expression (A) and IFN-γ/IL-4 ratio (B) of healthy donor-derived iNKT cells by mDC1 of healthy donors (n = 6) and advanced cancer patients with low (n = 6) and normal (n = 4) circulating iNKT cell levels after a 2-day coculture in the presence of α-GalCer, 20 U/ml IL-2, and the presence of isotype control mAb (open bars) or blocking anti-CD1d mAb (closed bars) are shown. CD25 expression and IFN-γ/IL-4 ratio induced by mDC1 of healthy controls were standardized to 100% and 1, respectively. Data represent mean and SD. As Th1 and Th2 functions of iNKT cells have been shown to be differentially regulated by the CD28/CD80–CD86 and CD40/CD40L costimulatory pathways (26), we assessed the expression of CD40, CD80, and CD86 on circulating mDC1 of cancer patients and healthy controls. CD86 was found to be expressed by 8.9 ± 8.4% of the mDC1 of healthy controls (n = 5) and 23.1 ± 27.0% of the mDC1 of cancer patients (n = 11, p = 0.27, unpaired t test), while CD40 and CD80 were not expressed by circulating mDC1 of either healthy controls or cancer patients (not shown). Although there were no significant differences in CD86 expression between the mDC1 of cancer patients and healthy controls ex vivo, we additionally evaluated whether blocking CD86-CD28 interactions would bias the cytokine profile of responding iNKT cells because activation might up-regulate them, and we found that the IFN-γ/IL-4 ratio of responding iNKT cells was not affected by blocking CD86-CD28 interactions in either healthy controls (n = 6, p = 0.68, paired t test) or cancer patients (n = 7, p = 0.09) (data not shown). Other factors that could potentially be involved in causing the reduced activation and biased cytokine profile of iNKT cells by mDC1 of cancer patients include the overproduction of Th2-polarizing or -suppressive cytokines such as IL-10 and TGF-β or the lack of the production of Th1-polarizing cytokines such as IL-12. Although a recent study indicated that mDC1 of patients with pancreatic cancer produced significantly lower amounts of IL-12 upon triggering compared with healthy controls (17), we could detect neither IL-12 nor IL-10 production by either mDC1 of cancer patients or healthy controls by using a wide range of stimuli (e.g., LPS, OK432, anti-CD1d mAb, and IFN-γ). However, we did find that stimulation with both LPS and anti-CD1d mAb induced TGF-β production by mDC1 of a healthy volunteer (n = 1) and, more pronounced, of an iNKT-low cancer patient (n = 1; 60 μg/ml vs 129 μg/ml (LPS) and 71 μg/ml vs 336 μg/ml (anti-CD1d mAb)). To evaluate the potential role of IL-10 and TGF-β in the defective activation and Th2 polarization of iNKT cells by mDC1 of iNKT-low cancer patients, we analyzed the activation and cytokine profiles of healthy donor-derived iNKT cells in the presence and absence of neutralizing Abs to IL-10 and TGF-β. Fig. 3⇓A demonstrates that the addition of a neutralizing TGF-β (TGF-β1, 2, and 3) Ab to cocultures of iNKT cells and mDC1 of iNKT-low cancer patients results in a 25.2 ± 15.7% (p = 0.02, paired t test) increase in the expression of CD25 by iNKT cells. In sharp contrast, neutralizing the effect of IL-10 secretion resulted in a 46.4 ± 8.1% (p = 0.001) decrease in iNKT cell activation, indicating a role for IL-10 in iNKT cell activation instead of inhibition. As a previous paper indicated that exogenous IL-12 could restore defective iNKT cell IFN-γ production in iNKT cells of cancer patients (9), we also tested the effects of rhIL-12 in the current culture system and found that it resulted in a 93.5 ± 47.9% (p = 0.005) increase in iNKT cell CD25 expression. rhIL-12 also resulted in a significant increase in the IFN-γ/IL-4 ratio of responding healthy donor-derived iNKT cells as determined by ELISA (fold change in IFN-γ/IL-4 ratio of 7.69 ± 3.35; n = 6, p = 0.005); in contrast, neutralizing Abs to IL-10 or TGF-β did not significantly alter the cytokine profile of responding iNKT cells (Fig. 3⇓B; fold change in IFN-γ/IL-4 ratio 0.92 ± 0.07 (n = 3, p = 0.16) and 1.42 ± 0.68 (n = 4, p = 0.31) in the presence of neutralizing Abs to IL-10 and TGFβ1–3, respectively). Effects of the neutralization of IL-10 and TGF-β in mDC1-iNKT cell interactions. Activation and cytokine profiles of healthy donor-derived iNKT cells cocultured with mDC1 of iNKT-low advanced cancer patients (ca) for 2 days in the presence of α-GalCer (n = 6) and neutralizing Abs to IL-10 (n = 4), neutralizing Abs to TGF-β1–3 (n = 5), or exogenous rhIL-12 (n = 6) as indicated are shown. 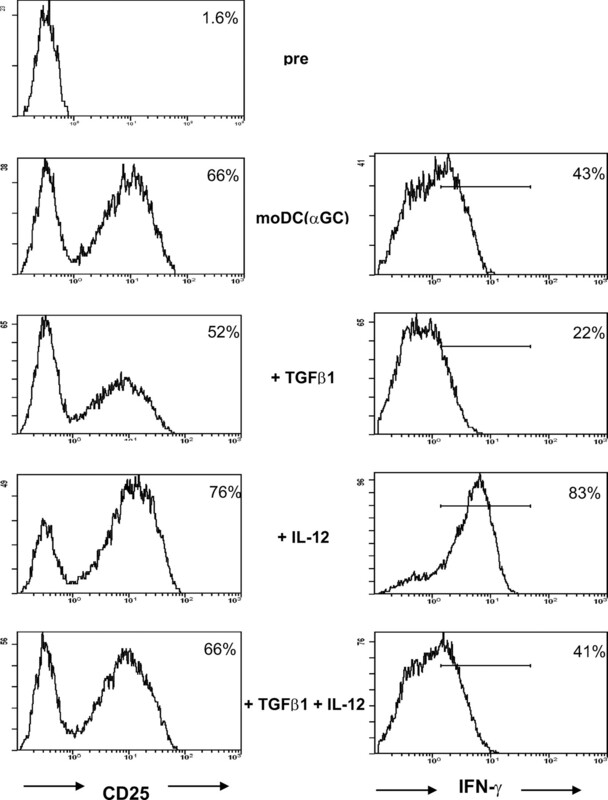 CD25 expression (A) and IFN-γ/IL-4 ratio (B) induced by mDC1 were standardized to 100% and 1, respectively. Data indicate mean ± SD. Because TGF-β was also detected in the supernatants of LPS- and anti-CD1d mAb-stimulated mDC1 of healthy volunteers, we additionally evaluated the effects of neutralizing TGF-β Abs on iNKT cell activation induced by healthy donor-derived mDC1 and found a trend toward an enhancement of iNKT cell activation by TGF-β neutralization; however, this was not statistically significant (increase in CD25 expression of 12 ± 7% (n = 3, p = 0.08, paired t test). In line, neutralization of TGF-β did not change the cytokine profile of iNKT cells activated by healthy donor-derived mDC1 (n = 3, p = 0.29) (not shown). As the data obtained with neutralizing TGF-β Abs indicated a suppressive role of TGF-β on iNKT cells, we further studied the effects of this cytokine on iNKT cell lines. For this reason, α-GalCer-loaded mature moDC were cocultured with iNKT cells in the presence or absence of 10 ng/ml rhTGF-β1 and/or 10 ng/ml rhIL-12 for 24 h. As expected, coculture of iNKT cells with α-GalCer-loaded moDC induced iNKT cell activation. Although this activation was enhanced by rhIL-12 (n = 6, p = 0.03, paired t test), it was suppressed by rhTGF-β1 (p = 0.01). Consistent with these results, rhTGF-β1 inhibited the enhancement of CD25 expression induced by rhIL-12 (Fig. 4⇓, left column). Because down-regulation of CD25 expression can be expected to down-regulate iNKT cell sensitivity toward the effects of its growth factor IL-2, we assessed iNKT cell proliferation after a 4-day coculture of iNKT and α-GalCer-loaded moDC in the presence or absence of 10 ng/ml rhTGF-β1 and found that iNKT cell proliferation was indeed reduced by 29.8 ± 16.4% (n = 7, p = 0.003) in the presence of TGF-β. TGF-β down-regulates iNKT cell CD25 expression and IFN-γ secretion. CD25 expression (left column) and IFN-γ secretion (right column) by healthy donor-derived iNKT cells before and after a 2-day coculture with α-GalCer-pulsed (αGC) moDC in the presence of rhTGF-β1 and rhIL-12 as indicated are shown. Percentages indicate the percentage of positive iNKT cells. Positive gate for IFN-γ secretion was determined using an isotype control Ab. Data of one representative donor (of seven) are shown. The effects of TGF-β on iNKT cell cytokine production were also studied. After a 24-h coculture of α-GalCer-loaded mature moDC and iNKT cells in the presence or absence of 10 ng/ml rhTGF-β1 and rhIL-12, iNKT cells were washed, coated with hybrid Ab-Ab conjugates directed against CD45 and IFN-γ, and subsequently allowed to secrete cytokines. We found that TGF-β resulted in a significant reduction in iNKT cell IFN-γ production (n = 7, p = 0.004, paired t test). In contrast, IL-12 resulted in a strong enhancement of IFN-γ production (p < 0.0001), but again the effect of IL-12 was significantly suppressed in the presence of TGF-β (p < 0.0001, Fig. 4⇑, right column). In supernatants of 24-h cocultures of α-GalCer-loaded moDC and iNKT cells the effects of rhTGF-β and rhIL-12 on iNKT cell IFN-γ/IL-4 ratios were also determined. Consistently, the presence of TGF-β resulted in a 0.77 ± 0.16-fold change in the IFN-γ/IL-4 ratio of α-GalCer-activated iNKT cells (Fig. 5⇓, p = 0.03, paired t test), and although the addition of IL-12 to the cultures resulted in a 3.94 ± 2.59-fold change in the IFN-γ/IL-4 ratio (p = 0.06), this was significantly reduced (0.67 ± 0.26-fold, p = 0.05) by the addition of TGF-β. Table I⇓ shows changes in the absolute levels of IFN-γ and IL-4 produced by iNKT cells in the various culture conditions. Overall, these data indicate that TGF-β suppresses iNKT cell responses and biases their cytokine production toward a Th2 profile. TGF-β reduces the IFN-γ/IL-4 ratio of α-GalCer-activated iNKT cells. TGF-β reduces the IFN-γ/IL-4 ratio (p = 0.03) of α-GalCer-activated iNKT cells and reduces the increase in the IFN-γ/IL-4 ratio of iNKT cells induced by IL-12 (p = 0.05). The IFN-γ/IL-4 ratio of controls was standardized to 1. Data represent mean and SD (n = 5). As the data obtained with neutralizing IL-10 Abs indicated a stimulatory rather than inhibitory role of IL-10 on iNKT cells, we further studied the effects of this cytokine on iNKT cell lines. First, we analyzed IL-10 receptor expression on iNKT cell lines and found IL-10Rα to be expressed by all (n = 6) tested iNKT cell lines (Fig. 6⇓A). Furthermore, we found that the expression of IL-10Rα was most prominent on resting iNKT cells and decreased upon activation (not shown). iNKT cell IL-10Rα expression and effects of IL-10 on iNKT cell activation and IFN-γ secretion. A, Histogram showing the expression of IL-10Rα (bold line) on iNKT cells. The thin line represents isotype control. Representative histogram of one donor (of six) is shown. B, IL-10 enhances iNKT cell CD25 expression (p = 0.002; top panels) and reduces iNKT cell IFN-γ secretion (p = 0.002; bottom panels) upon coculture of iNKT cells and α-GalCer-pulsed moDC. Representative data from one of eight experiments are shown. Next, we evaluated the effects of IL-10 on iNKT cell CD25 expression and cytokine production during cocultures of α-GalCer-loaded moDC and iNKT cell lines. Consistent with the data obtained using neutralizing IL-10 Abs, we found that rhIL-10 (100 ng/ml) resulted in an enhanced up-regulation of the expression of CD25 on iNKT cells activated by α-GalCer-loaded moDC (Fig. 6⇑B; n = 8, p = 0.002, paired t test). Of note, the increased expression of CD25 (IL-2Rα) on iNKT cells resulted in an increase in their susceptibility to the proliferative effects of IL-2, as iNKT cell proliferation increased 32.7 ± 13.6% in the presence of 10 ng/ml rhIL-10 (n = 3, p = 0.05) and 13.6 ± 17.9% in the presence of 100 ng/ml rhIL-10 (n = 7, p = 0.09) during a 4-day culture of iNKT cells and α-GalCer-loaded moDC. However, in contrast to the stimulating effects of IL-10 on both iNKT cell CD25 expression and proliferation, we found that the percentage of IFN-γ-secreting iNKT cells was reduced by an average of 49.4 ± 24.3% (n = 7, p = 0.002) when cells were cocultured with α-GalCer-loaded moDC in the presence of 100 ng/ml rhIL-10 (Fig. 6⇑B). This decrease in IFN-γ production was not accompanied by a shift in the cytokine balance of iNKT cells, as the IFN-γ/IL-4 ratio in supernatants 1 day after coculture of α-GalCer-loaded moDC and iNKT cells was 2.61 ± 2.15 in the medium control and 2.36 ± 2.06 in the presence of 100 ng/ml IL-10 (n = 5, p = 0.44). We next evaluated the effects of the IL-10 treatment of iNKT cells on their capacity to cross-talk with both T cells and NK cells. For this purpose, iNKT cells were cultured for 24 h with α-GalCer-loaded moDC in the presence or absence of 100 ng/ml rhIL-10 and (after extensive washing) subsequently transferred to plain medium for an additional 24 h. At this point, supernatants were harvested and used as culture media for both NK cells and CD4+ T cells that were purified from peripheral blood. Importantly, we found that the supernatant derived from iNKT cells activated in the presence of IL-10 reduced NK cell IFN-γ secretion in three of three donors (reduction in NK cell IFN-γ secretion of 36.2 ± 18.7%; p = 0.08, paired t test). Furthermore, the iNKT cell supernatant derived from iNKT cells activated in the presence of IL-10 resulted in a reduction of IFN-γ secretion by anti-CD3/anti-CD28 mAb-activated CD4+ T cells in the same three of three donors (reduction in CD4+ T cell IFN-γ secretion 44.4 ± 34%; p = 0.15). Representative data from one donor are shown in Fig. 7⇓. IL-10 modulates cross-talk between iNKT cells and CD4+ T cells. Dot plots show IFN-γ secretion by CD4+ T cells activated using anti-CD3 and anti-CD28 mAbs after an initial 72 h culture in the iNKT cell supernatant derived from iNKT cells that were activated in the presence (right) or absence (left) of 100 ng/ml IL-10 and 1 μg/ml anti-CD3 mAb. Flow cytometric dot plots demonstrate representative results from one of three experiments. In this study we show that circulating mDC1 of patients with advanced melanoma and renal cell cancer resulted in reduced activation and a biased cytokine profile in healthy donor-derived iNKT cells, suggesting that this defective interaction contributes to the previously observed qualitative and quantitative defects in iNKT cells of cancer patients (7, 8, 9, 10, 11, 12, 13, 14). This is underscored by the observation that only the mDC1 of cancer patients with low circulating iNKT cell numbers, but not the mDC1 of cancer patients with normal circulating iNKT cell numbers, resulted in this biased iNKT cell response, indicating that the circulating iNKT cell frequency of cancer patients appears to reflect the Ag-presenting quality of their circulating mDC1. As the differences in the costimulatory interactions between iNKT cells and mDC1 of healthy controls and advanced cancer patients did not explain the reduced activation of healthy donor-derived iNKT cells, we evaluated the potential role of IL-10 and TGF-β because these cytokines are frequently implicated in mediating immunosuppression in cancer (27, 28, 29) and have been implicated in compromising DC function in cancer patients (16, 30). Indeed, in cocultures of circulating mDC1 of cancer patients and iNKT cell lines, we found that neutralization of TGF-β enhanced iNKT cell activation, although this was not accompanied by a significant shift in their cytokine profile. In additional experiments in which we evaluated the direct effects of TGF-β on iNKT cell lines, we found that TGF-β indeed reduced α-GalCer- and IL-12-induced iNKT cell activation and proliferation but also inhibited IFN-γ production, resulting in a Th2-biased iNKT cell cytokine profile. These effects of TGF-β on iNKT cells, although in accordance with its effects on conventional T cells (31), expand upon previous reports on the effects of this cytokine on iNKT cells, which were limited to the demonstration that TGF-β signaling regulated iNKT cell development (32, 33). Interestingly, neutralizing the effects of IL-10 in cocultures of iNKT cells and the circulating mDC1 of cancer patients resulted in a decrease in iNKT cell activation, suggesting that IL-10 enhanced iNKT cell activation. Because IL-10 has been reported to be able to enhance CD25 expression and proliferation of T cell clones (34, 35), we additionally evaluated the direct effects of IL-10 on iNKT cells. Indeed, in experiments in which IL-10 was added to cocultures of iNKT cells and α-GalCer-pulsed moDC, an increase in iNKT cell CD25 expression was accompanied by an increase in iNKT cell proliferation. Although iNKT cells activated in the presence of IL-10 produced significantly lower amounts of IFN-γ, their overall cytokine profile was not significantly altered. As IL-10Rα expression appeared to be most prominent on resting iNKT cells, one can hypothesize that iNKT cell activation in the presence of IL-10 will result in their preferential activation and expansion and thereby result in a less proinflammatory population of iNKT cells. This is supported by experiments in which we demonstrate that iNKT cell activation in the presence of IL-10 results in differences in cross-talk between iNKT cells and both NK cells and conventional CD4+ T cells, as characterized by a reduction in IFN-γ production. Because IL-10 can be produced by, e.g., malignant tumors, our data might indicate a novel way in which tumors down-regulate anti-tumor immunity, i.e., by supporting the selective outgrowth of immunoregulatory iNKT cells that subsequently suppress proinflammatory anti-tumor properties of NK cells and T cells. The supernatant of non-IL-10 producing iNKT cell lines was found to similarly reduce NK and T cell IFN-γ secretion (not shown), suggesting that the suppressive effect of IL-10-treated iNKT cells does not require IL-10 production by iNKT cells themselves. Our data indicate that defective interactions between CD1d-expressing mDC1 and iNKT cells cause defects in circulating iNKT cells in cancer patients. The mechanism is however still incompletely understood, although it may involve the (over)production of TGF-β and perhaps defective IL-12 production by mDC1. Future studies could evaluate the role of, e.g., vascular endothelial growth factor, prostanoids, and NO, as these have all been reported to be involved in mediating tumor immune suppression through effects on DC (36, 37, 38, 39). In light of the accumulating evidence indicating the prognostic significance of iNKT cells in cancer patients, these studies might provide important clues as to how to restore iNKT cell function. In conclusion, we report that circulating mDC1 of patients with advanced melanoma and RCC result in reduced activation and a biased cytokine profile of iNKT cells and are therefore likely to be involved in causing the known quantitative and qualitative defects in iNKT cells in cancer. This reduced activation of iNKT cells could be reversed by IL-12 and, in part, by neutralization of TGF-β but not IL-10. IL-10 was identified as a cytokine involved in the activation and expansion of a population of iNKT cells that can subsequently suppress NK cell and T cell responses. ↵1 This work was supported by the Netherlands Organization for Scientific Research NWO-TALENT Grant and Grant 920-03-142, a Dutch Cancer Society (KWF) Academic Grant, National Institutes of Health Grants R01 DK066917 and R01 AI42955, and the Dana Farber/Harvard Cancer Center Melanoma Specialized Program of Research Excellence Grant P50 CA93683. ↵3 Abbreviations used in this paper: iNKT, CD1d-restricted invariant NKT (cell); α-GalCer, α-galactosylceramide; DC, dendritic cell; mDC, myeloid DC; moDC, monocyte-derived DC; pDC, plasmacytoid DC; RCC, renal cell cancer; rh, recombinant human. Kronenberg, M., A. Rudensky. 2005. Regulation of immunity by self-reactive T cells. Nature 435: 598-604.
van der Vliet, H. J., J. W. Molling, B. M. von Blomberg, N. Nishi, W. Kolgen, A. J. van den Eertwegh, H. M. Pinedo, G. Giaccone, R. J. Scheper. 2004. The immunoregulatory role of CD1d-restricted natural killer T cells in disease. Clin. Immunol. 112: 8-23.
van der Vliet, H. J., S. P. Balk, M. A. Exley. 2006. Natural killer T cell-based cancer immunotherapy. Clin. Cancer Res. 12: 5921-5923. Swann, J. B., J. M. Coquet, M. J. Smyth, D. I. Godfrey. 2007. CD1-restricted T cells and tumor immunity. Curr. Top. Microbiol. Immunol. 314: 293-323. Fujii, S., K. Shimizu, H. Hemmi, R. M. Steinman. 2007. Innate Vα14+ natural killer T cells mature dendritic cells, leading to strong adaptive immunity. Immunol. Rev. 220: 183-198. Bendelac, A., P. B. Savage, L. Teyton. 2007. The biology of NKT cells. Annu. Rev. Immunol. 25: 297-336.
van der Vliet, H. J., J. W. Molling, N. Nishi, A. J. Masterson, W. Kolgen, S. A. Porcelli, A. J. van den Eertwegh, B. M. von Blomberg, H. M. Pinedo, G. Giaccone, R. J. Scheper. 2003. Polarization of Vα24+Vβ11+ natural killer T cells of healthy volunteers and cancer patients using α-galactosylceramide-loaded and environmentally instructed dendritic cells. Cancer Res. 63: 4101-4106. Molling, J. W., W. Kolgen, H. J. van der Vliet, M. F. Boomsma, H. Kruizenga, C. H. Smorenburg, B. G. Molenkamp, J. A. Langendijk, C. R. Leemans, B. M. von Blomberg, et al 2005. Peripheral blood IFN-γ-secreting Vα24+Vβ11+ NKT cell numbers are decreased in cancer patients independent of tumor type or tumor load. Int. J. Cancer 116: 87-93. Tahir, S. M., O. Cheng, A. Shaulov, Y. Koezuka, G. J. Bubley, S. B. Wilson, S. P. Balk, M. A. Exley. 2001. Loss of IFN-γ production by invariant NK T cells in advanced cancer. J. Immunol. 167: 4046-4050. Dhodapkar, M. V., M. D. Geller, D. H. Chang, K. Shimizu, S. Fujii, K. M. Dhodapkar, J. Krasovsky. 2003. A reversible defect in natural killer T cell function characterizes the progression of pre-malignant to malignant multiple myeloma. J. Exp. Med. 197: 1667-1676. Tachibana, T., H. Onodera, T. Tsuruyama, A. Mori, S. Nagayama, H. Hiai, M. Imamura. 2005. Increased intratumor Vα24-positive natural killer T cells: a prognostic factor for primary colorectal carcinomas. Clin. Cancer Res. 11: 7322-7327. Molling, J. W., J. A. Langius, J. A. Langendijk, C. R. Leemans, H. J. Bonkes, H. J. van der Vliet, B. M. von Blomberg, R. J. Scheper, A. J. van den Eertwegh. 2007. Low levels of circulating invariant natural killer T cells predict poor clinical outcome in patients with head and neck squamous cell carcinoma. J. Clin. Oncol. 25: 862-868. Metelitsa, L. S., H. W. Wu, H. Wang, Y. Yang, Z. Warsi, S. Ashqharzadeh, S. Groshen, S. B. Wilson, R. C. Seeger. 2004. Natural killer T cells infiltrate neuroblastomas expressing the chemokine CCL2. J. Exp. Med. 199: 1213-1221. Shaulov, A., S. Yue, R. J. Wang, R. M. Joyce, S. P. Balk, H. T. Kim, D. E. Avigan, L. Uhl, R. Sackstein, M. A. Exley. 2008. Peripheral blood progenitor cell product contains Th1-biased noninvariant CD1d-reactive natural killer T cells: implications for posttransplant survival. Exp. Hematol. 36: 464-472. Hoffman, T. K., J. Muller-Berghaus, R. L. Ferris, J. T. Johnson, W. J. Storkus, T. L. Whiteside. 2002. Alterations in the frequency of dendritic cell subsets in the peripheral circulation of patients with squamous cell carcinomas of the head and neck. Clin. Cancer Res. 8: 1787-1793. Yanagimoto, H., S. Takai, S. Satoi, H. Toyokawa, K. Takahashi, N. Terakawa, A. H. Kwon, Y. Kamiyama. 2005. Impaired function of circulating dendritic cells in patients with pancreatic cancer. Clin. Immunol. 114: 52-60. Yue, S. C., A. Shaulov, R. Wang, S. P. Balk, M. A. Exley. 2005. CD1d ligation on human monocytes directly signals rapid NF-κB activation and production of bioactive IL-12. Proc. Natl. Acad. Sci. USA 102: 11811-11816. Tomura, M., W. G. Yu, H. J. Ahn, M. Yamashita, Y. F. Yang, S. Ono, T. Hamaoka, T. Kawano, M. Taniguchi, Y. Koezuka, H. Fujiwara. 1999. A novel function of Vα14+CD4+NKT cells: stimulation of IL-12 production by antigen-presenting cells in the innate immune system. J. Immunol. 163: 93-101. Kitamura, H., K. Iwakabe, T. Yahata, S. Nishimura, A. Ohta, Y. Ohmi, M. Sato, K. Takeda, K. Okumura, L. van Kaer, et al 1999. The natural killer T (NKT) cell ligand α-galactosylceramide demonstrates its immunopotentiating effect by inducing interleukin (IL)-12 production by dendritic cells and IL-12 receptor expression on NKT cells. J. Exp. Med. 189: 1121-1128. Eberl, G., H. R. MacDonald. 2000. Selective induction of NK cell proliferation and cytotoxicity by activated NKT cells. Eur. J. Immunol. 39: 985-992.
van der Vliet, H. J., H. B. Koon, S. C. Yue, B. Uzunparmak, V. Seery, M. A. Gavin, A. Y. Rudensky, M. B. Atkins, S. P. Balk, M. A. Exley. 2007. Effects of the administration of high-dose interleukin-2 on immunoregulatory cell subsets in patients with advanced melanoma and renal cell cancer. Clin. Cancer Res. 13: 2100-2108. Dzionek, A., A. Fuchs, P. Schmidt, S. Cremer, M. Zysk, S. Miltenyi, D. W. Buck, J. Schmitz. 2000. BDCA-2. BDCA-3, and BDCA-4: three markers for distinct subsets of dendritic cells in human peripheral blood. J. Immunol. 165: 6037-6046.
van der Vliet, H. J., J. W. Molling, B. M. von Blomberg, W. Kolgen, A. G. Stam, T. D. de Gruijl, C. J. Mulder, H. L. Janssen, N. Nishi, A. J. van den Eertwegh, et al 2005. Circulating Vα24+Vβ11+ NKT cell numbers and dendritic cell CD1d expression in hepatitis C virus infected patients. Clin. Immunol. 114: 183-189. Hayakawa, Y., K. Takeda, H. Yagita, L. van Kaer, I. Saiki, K. Okumura. 2001. Differential regulation of Th1 and Th2 functions of NKT cells by CD28 and CD40 costimulatory pathways. J. Immunol. 166: 6012-6018. Trapani, J. A.. 2005. The dual adverse effects of TGF-β secretion on tumor progression. Cancer Cell 8: 349-350. Kim, R., M. Emi, K. Tanabe. 2006. Cancer immunosuppression and autoimmune disease: beyond immunosuppressive networks for tumour immunity. Immunology 119: 254-264. Brown, R., A. Murray, B. Pope, D. M. Sze, J. Gibson, P. J. Ho, D. Hart, D. Joshua. 2004. Either interleukin-12 or interferon-γ can correct the dendritic cell defect induced by transforming growth factor β in patients with myeloma. Br. J. Hematol. 125: 743-748. Beckebaum, S., X. Zhang, X. Chen, Z. Yu, A. Frilling, G. Dworacki, H. Grosse-Wilde, C. E. Broelsch, G. Gerken, V. R. Cicinnati. 2004. Increased levels of interleukin-10 in serum from patients with hepatocellular carcinoma correlate with profound numerical deficiencies and immature phenotype of circulating dendritic cell subsets. Clin. Cancer Res. 10: 7260-7269. Li, M. O., Y. Y. Wan, S. Sanjabi, A. K. Robertson, R. A. Flavell. 2006. Transforming growth factor-β regulation of immune responses. Annu. Rev. Immunol. 24: 99-146. Marie, J. C., D. Liggitt, A. Y. Rudensky. 2006. Cellular mechanisms of fatal early-onset autoimmunity in mice with the T cell-specific targeting of transforming growth factor-β receptor. Immunity 25: 441-454. Li, M. O., S. Sanjabi, R. A. Flavell. 2006. Transforming growth factor-β controls development, homeostasis, and tolerance of T cells by regulatory T cell-dependent and -independent mechanisms. Immunity 25: 455-471. Cohen, S. B., P. D. Katsikis, M. Feldmann, M. Londei. 1994. 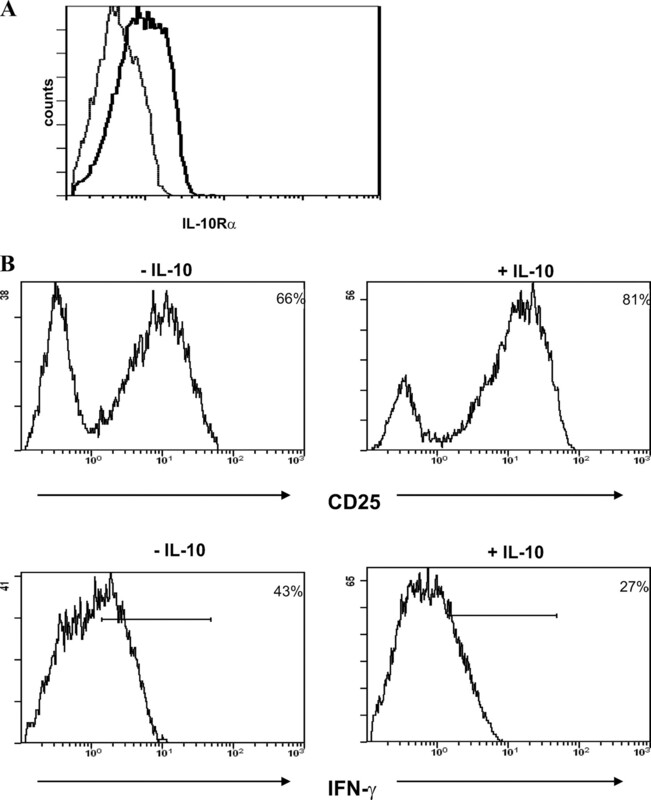 IL-10 enhances expression of the IL-2 receptor α chain on T cells. Immunology 83: 329-333. Ho, A. S., K. W. Moore. 1994. Interleukin-10 and its receptor. Ther. Immunol. 1: 173-185. Gabrilovich, D. I., H. L. Chen, K. R. Girgis, H. T. Cunningham, G. M. Meny, S. Nadaf, D. Kavanaugh, D. P. Carbone. 1996. Production of vascular endothelial growth factor by human tumors inhibits the functional maturation of dendritic cells. Nat. Med. 2: 1096-1103. Sombroek, C. C., A. G. Stam, A. J. Masterson, S. M. Lougheed, M. J. Schakel, C. J. Meijer, H. M. Pinedo, A. J. van den Eertwegh, R. J. Scheper, T. D. De Gruijl. 2002. Prostanoids play a major role in the primary tumor-induced inhibition of dendritic cell differentiation. J. Immunol. 168: 4333-4343. Yang, L., N. Yamagata, R. Yadav, S. Brandon, R. L. Courtney, J. D. Morrow, Y. Shyr, M. Boothby, S. Joyce, D. P. Carbone, R. M. Breyer. 2003. Cancer-associated immunodeficiency and dendritic cell abnormalities mediated by the prostaglandin EP2 receptor. J. Clin. Invest. 111: 727-735. Yanagisawa, K., M. A. Exley, X. Jiang, N. Ohkochi, M. Taniguchi, K. Seino. 2006. Hyporesponsiveness to natural killer T-cell ligand α-galactosylceramide in cancer-bearing state mediated by CD11b+ Gr-1+ cells producing nitric oxide. Cancer Res. 66: 11441-11446.